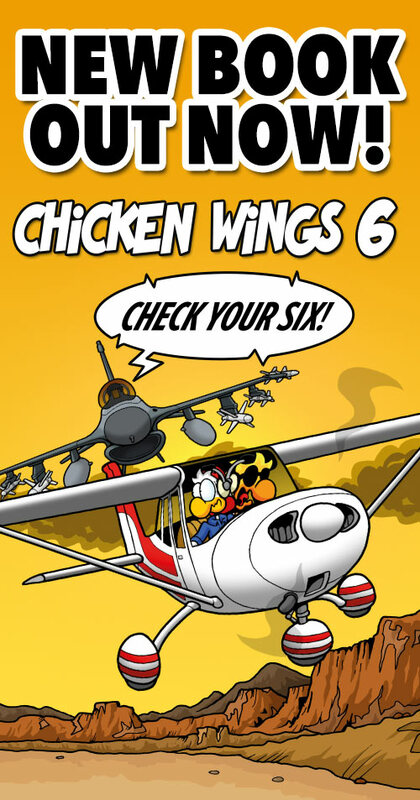 I don’t know how many of you are aware that we have something of a “spin off” series from Chicken Wings, called “Moments in Aviation History”. We rarely ever put any strips on our website, but Mike sends some of them to Trade-A-Plane, and they are a regular feature in the German aviation history magazine Flugzeug Classic. We’re slowly building up a repertoire big enough to make a whole book with them, but it will still take a little while. It may or may not come out before Chicken Wings number six. Anyway, here’s one cartoon from the series. For those of you who, like us, always wondered where this particular peculiar tradition stems from. Ah, it was Chuck’s Ocean Airways, not Chalk’s… Easy mistake to make! I didn’t get the reference at first, I’m never offered hot towels on airlines, is that a thing? If so must be for first class, not us peasants in cattle class! Quill, service like that was once available to all passengers, but considering inflation, the cheap fares were similar to first-class fares now. The FAA didn’t allow airlines to cut the rates, so they competed on service. Until the large jets came out in the 1960’s, in everything but the seat size, meals, and the stewardess service, the conditions were considerably worse than today; the ride was bumpy far more often, flights were more likely to be diverted or canceled due to weather, and the airplanes were slower so you spent more time in the air. Worst of all, you were several times as likely to die in a crash – although I think by the end of the 1950’s, airline travel was safer per passenger mile than driving (in cars that were death traps by today’s standards). The engine is right behind him, and there are the lines going from the engine to the radiator right behind their heads. Part of the radiator fluid must divert to a small compartment near the pilot so he can have easy access to hot towels! Ah, makes sense. Pre-deregulation, when airlines competed on posh-ness rather than the cutthroat price wars we see now. I’m fairly young, so I guess this is sort of a “before my time” sort of thing. It is also a good point that as much as we romanticize the old times, with big piston airliners like Super Connies, they really were much worse than modern airliners – very expensive tickets (flying was out of reach for most people), loud, bumpy, slow, unreliable, unsafe. We’ve come a long way, even if a few aspects have suffered.